I'm still in complete denial about that fact that it's Spring already, and it seems that the weather gods are too. It's been super chilly and rainy the last couple weekends in Sydney, which has been bad for any outdoor plans, but great for baking! While I am lucky enough to have a few more chilly afternoons, I've been loving everything to do with pumpkin. We've been eating tons of roasted pumpkin and parsnip with our dinners, and I've been wanting to use pumpkin puree in all my baking. They turned out a little bit thinner than the banoffee blondies, maybe the puree made them slightly more dense so they didn't rise as much, so I've adjusted the recipe to use a slightly smaller baking pan. They're definitely not the prettiest things I've ever baked, the white chocolate chips go all brown on top in the oven which makes them look kinda fugly, but I love the little pops of sweetness that the white chocolate gives them. 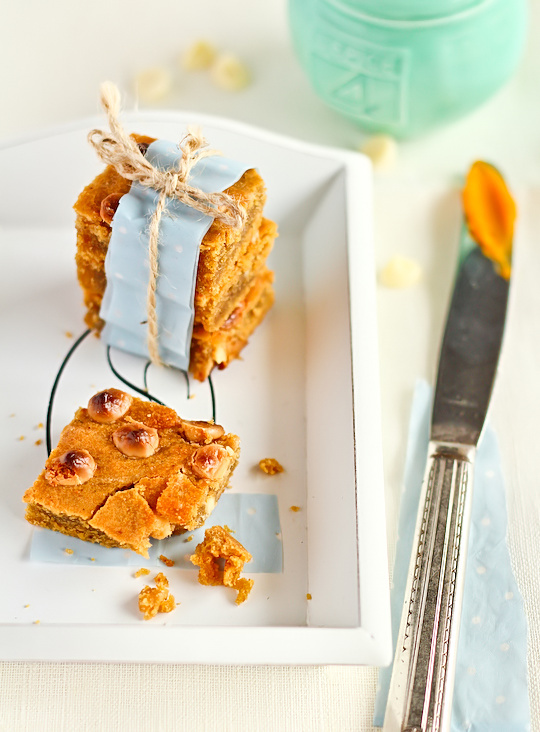 The colour of these blondies is as gorgeous and bright as anything else I've ever baked with pumpkins. Maybe next time I might try mixing all the chocolate chips into the batter rather than sprinkling it on top so it won't have the ugly brown bumps on top. I still have heaps of leftover pumpkin puree so I think I might have to whip up some pumpkin pancakes with cinnamon butter. I must be one of the few people in Sydney who is hoping we have a few more cooler days so that I can enjoy my pumpkin desserts. For those of you in the northern hemisphere this recipe is perfect for autumn, enjoy! Preheat oven to 180°C (350°F). Brush a 20cm (8-inch) square baking pan (I used a 17x27cm slice/brownie tin but found it was a tad too large) with some melted butter; line pan with a piece of baking paper, leaving a 2-inch overhang on two sides. Butter paper. Prepare the brown butter; place butter in a small saucepan on low heat until it melts, continue to stir over low heat but keep a close eye on it, as it begins to bubble and the milk solids separate and settle at the bottom of the pan. Stir it frequently at this point, so that the milk solids do not settle at the bottom of the pan for too long and burn. Continue until the mixture turns brown and smells nutty but take care not to leave it for too long or it will taste burnt. Remove from the heat. In a large bowl, lightly whisk browned butter and sugars until smooth. Whisk in egg and vanilla and pumpkin puree. Add cinnamon, allspice, nutmeg, flour and salt; stir just until moistened (do not overmix). Fold in 1/2 cup of white chocolate chips. Transfer batter to prepared pan; smooth top. Sprinkle with remaining white chocolate chips. Bake until top is golden brown and a toothpick inserted into the center comes out clean, about 30-35 minutes (25-30 mins for the larger pan). Set pan on a wire rack, and let cool completely. Using parchment overhang, lift cake from pan and transfer to a cutting board; cut into 20 pieces. 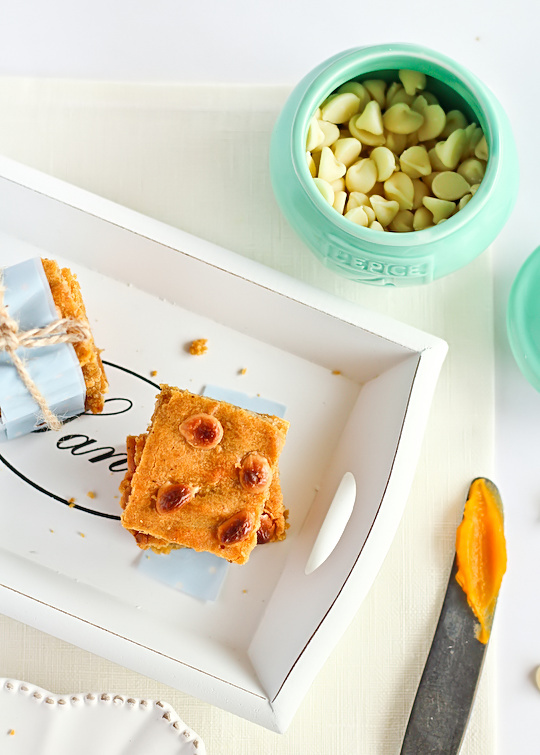 Blondies can be stored for several days in an airtight container in the fridge. Serve at room temperature. 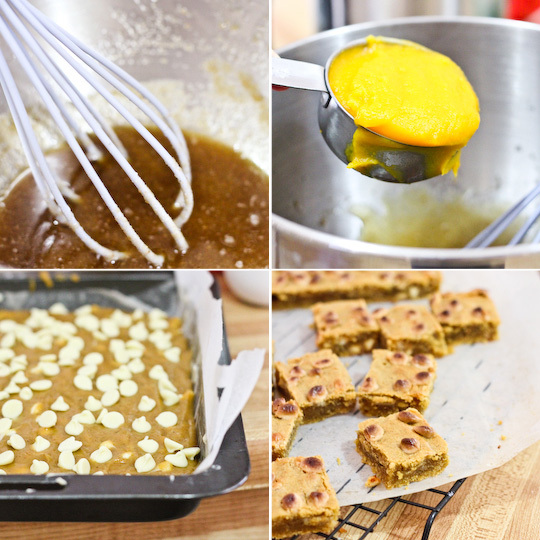 Mmm, pumpkin & brown butter! Love that the pumpkin makes these slightly healthier but importantly tastier too! 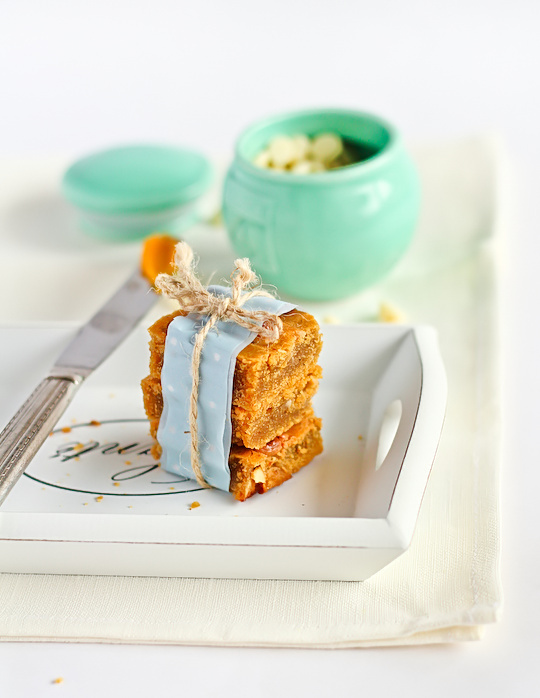 blondies have always been such a treat, love your presentation looks really nice, great photos. These are so inviting, wow. Pumpkin is a favorite flavor in everything for me. They look delicious and beautiful! Inspiring, thanks. Never had blondies before but these look delish! Love the use of pumpkin! Yum! Just made this tonight for a high school church bible study tomorrow! This look fabulous. What a great way to use pumpkin! Not to mention..nothing beats brown butter. i loooooove baking with pumpkin and you've convinced me this would be great, and i don't think your white chocolate looks fugly! 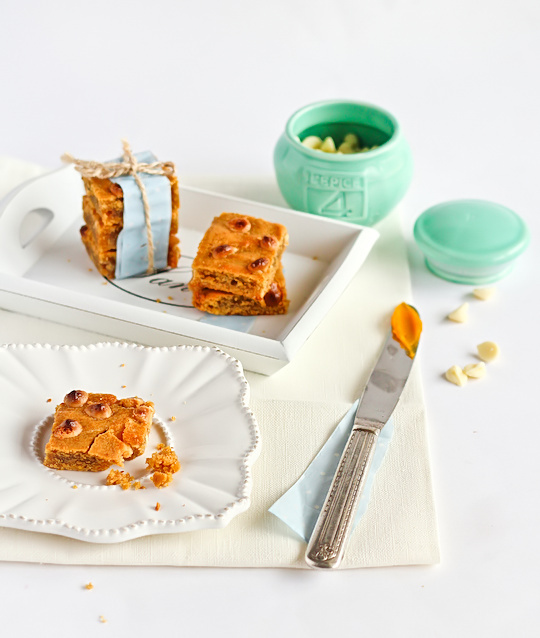 I love pumpkin and I love blondies! This is my ideal recipe, thanks! Mmm, brown butter and pumpkin. 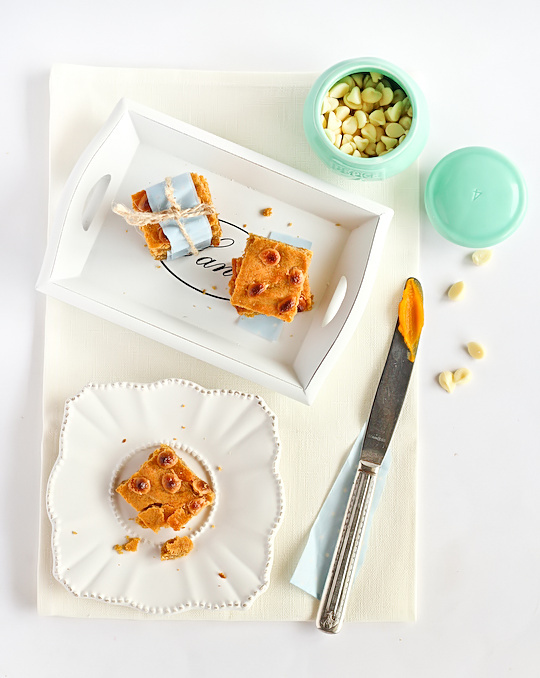 I'm going to make these next time I get winter squash in my CSA, but I'll swap in walnuts for the white chocolate chips. Our local paper just ran a story on blondie variations. I think ill drizzile the white chocolate melted instead of sprinkling chips. I made these and they were divine. Oh my gosh I had to have my boyfriend restrain me from eating the entire batch myself. Your photography is beautiful, and this recipe looks spot on! 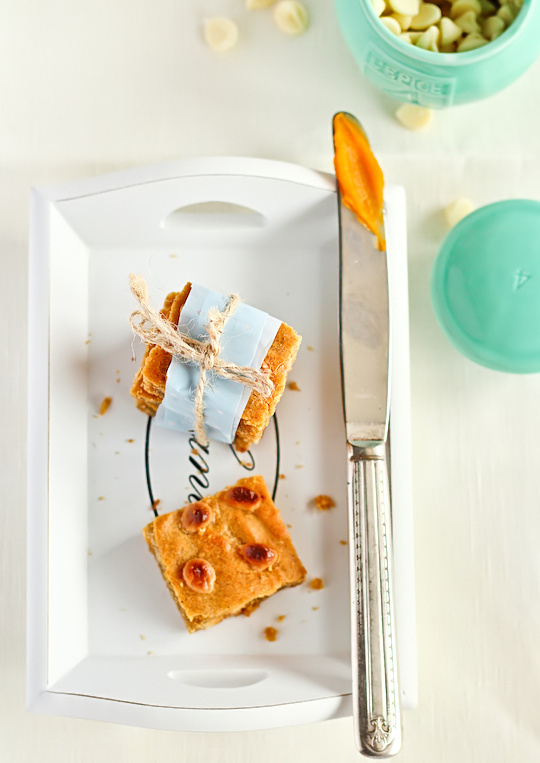 (Found it in a google search for brown butter pumpkin blondies) Looking forward to giving it a go, and to perusing your fabulous site. Cheers! These are in the oven right now ... I pretty much died trying not to eat all the batter. Congrats and you just got a new follower! I made these this weekend. They are so good! They are a bit thin, so maybe next time I'll double the recipe but keep the salt the same. I also made these sans chips, which would have made them more desert-y.